Claws & Feathers is rated 4.3 out of 5 by 40. 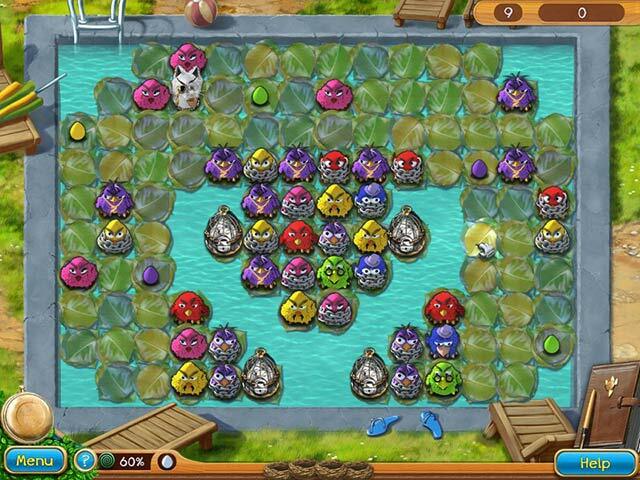 Rated 5 out of 5 by blueskies60 from Gobs of Fobs on Steroids This is so much fun and extremely addictive. Initially seems ok but as you progress the challenges increase and now I am addicted in the best way. Reminiscent of "Gobs of Fobs" if you are familiar with the game which doesn't seem to run on W10. This is way better. Angry chickens; evil cats; great fun! Rated 5 out of 5 by miansc from FUN AND CHALLENGING! If you're ready to have fun but enjoy an exciting challenge, this game is a most. At first I wasn't really expecting the level of challenge but as I stared at the screen and started to play I found myself laughing and getting in to beating the levels. A very clever game but if you feeling stressed wait to give it all you can. I can say you won't be bored. I love this game. Give it a try and I bet you will too! Have fun and enjoy! Rated 5 out of 5 by pedz69 from Praise be ! Claws & Feathers, Expect to be tested !! What a delightful game. related to match 3 but so clever and addictive. 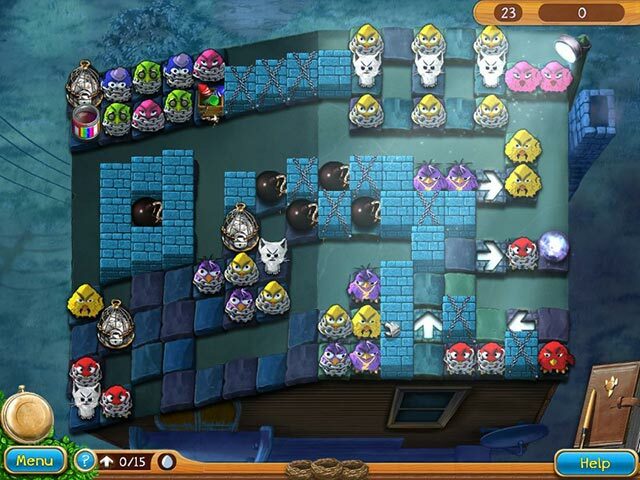 The game play is unique and the creatures are fascinating in their behaviour. On the early screens the game seems too easy, but rest assured as you progress it gets really challenging. You have to keep coming back for more , especially if you want to maximise the score on screens where you didn't mange the whole requirements. Graphics and sound good standard - gameplay superb One of the best , think before you move, games I have encountered. Don't hesitate - get it and find out. Really recommend this and looking for sequel. Rated 5 out of 5 by upsysydaisy from Frustration Amundo !! This silly little game had me a feather away from stepping down from my expert level. A match 3 strategy game ! Easy, you say?!! Well, just give it a try and get ready to be surprised. The goofy looking birds and the silly sounds were so comical and entertaining. I had a spot of trouble learning the game-play but after a couple of failures I was in it for the long haul. What a clever game, so creative! One of my fave features was the cat being picked up and flown away. Also appreciated that not achieving the goal did not keep you from moving on into the game. Getting stuck and having to start over is very discouraging when you just want to have some stress free fun. I highly recommend this unusual little gem. A perfect change of pace. Even though match 3 appeals to so many young gamers, this one might not be so easy for all of them. Rated 5 out of 5 by patgutta from Gluing yourself to computer! Totally addictive,,, right hand cramps... Loved it, wish there was a #2 for Mac!!! Rated 5 out of 5 by bessiegirl from What a ride... 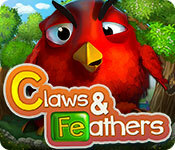 Certainly not for the beginner match 3 player, however this first claws and feathers was easier than the 2nd one. Don't get me wrong...not EASY, but easier. I was able to get many more gold stars on this version. I don't drive myself crazy by trying to achieve all gold stars; I honestly think that is impossible, you would be playing this for the rest of your life if that is your goal. Hard, but lots and lots of fun. Strategy is the key ingredient and you need to be thinking ahead. Not for the faint of heart. Patience is also a requirement. Have fun...don't get frustrated and just quit and say its impossible...its possible and you need to be satisfied with some silver stars and consider that an achievement most of the time! Rated 5 out of 5 by MoochersMom from LOVE, LOVE, LOVE THIS GAME!!! 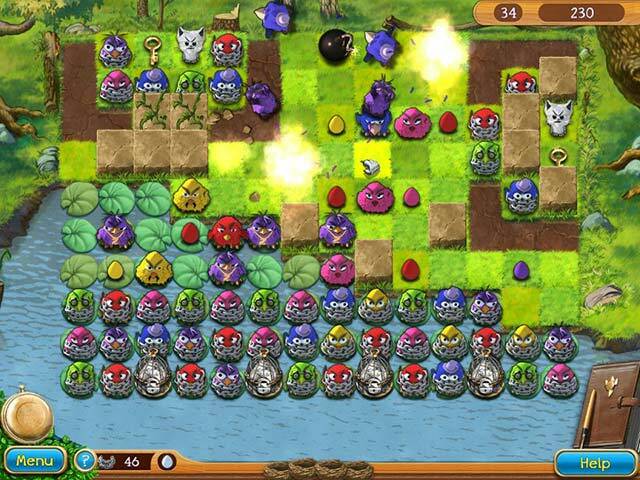 This is a challenging game that requires a lot of strategy, patience and a little bit of luck. It may look like a child's game, but it definitely isn't. I've run thru all 56 levels 3 times so far and will likely keep at it until I get 56 golden eggs. A little piece of advice...make sure you keep your playing field as clean as possible. If you like a challenge, this game is for you. Try it!! Rated 5 out of 5 by Minnie1937 from Best type of Match3 This game entertained me for hours. I liked the level of the strategy. Harder than most M3 games but possible to solve after a few tries. No time limit and can return easily to any level already solved to improve your prior play. Rated 5 out of 5 by knoxvegas56 from Not your usual boring Match 3 I've owned this game for a few years and find myself going back to it time and again to replay. The story line is simple: cats have stolen chicks and locked them up, you have to rescue them. The play is a strategy match 3--if you are looking for a boring game to help you go to sleep, this is not it. Not all levels are the same--some require being finished in X amount of moves, others require completing while making sure that less birds of a specific color fly away. It is interesting from beginning to end. It's a very different and fun game. Rated 5 out of 5 by GRHA from Such fun Even if you don't normally like match three games this is a must. Levels can be passed and replayed so you can not get stuck. Has kept me happy for hours.